Gunfire left three wounded and one dead in Humboldt Park on a freezing Wednesday afternoon. The shooting happened near the intersection of St. Louis and Chicago avenues around 12:30 p.m.
“I heard ‘Boom boom boom,’” said a man who asked not to be identified. He’s lived in the area for ten years and said the past few weeks have been extremely violent for the Humboldt Park neighborhood. “It’s like a damn war zone out here,” he said, referring to the spat of gang related shootings that happened over the weekend and into yesterday morning. Two of the shooting victims, men ages 24 and 31, were taken to Stroger Hospital. Tyris Ferguson, 23, was taken to Mount Sinai Medical Center. The fourth victim, a 26-year-old male pedestrian, was taken to Northwestern Memorial Hospital, said Police News Affairs Officer Veejay Zala. The 24-year-old was shot in his body, the 31-year-old was shot in his arms and legs and the 26-year-old pedestrian was shot in his lower leg, said Zala. At press time the pedestrian’s condition had stabilized and the condition of the other two men was unknown. The Cook County Medical Examiner’s Office said Ferguson was pronounced dead at 12:59 p.m. Immediately after the shooting CTA busses were rerouted around the police presence at the intersection. While police investigated Wednesday afternoon, a white Pontiac Grand Prix was still sitting at the intersection of St. Louis and Chicago. Its windows were shattered, its damaged front bumper had come off and its doors were pot marked by multiple bullet holes. A bundle of bloody clothes lay on the street, directly to the right of the Pontiac. Ferguson lived in the 800 block of N. St. Louis and police say he and the 24 and 31-year-old men were in the Pontiac when a van pulled up next to them and opened fire before fleeing, said Zala, regarding the preliminary investigation on Wednesday around 6 p.m.
“An investigation is ongoing by Area North detectives,” said Police News Affairs Officer Thomas Sweeney. A sign on an empty lot facing Chicago Avenue on the southwest corner of the intersection had “Welcome to West Humboldt Park” gratified on it. It looked like it had been there a while and the empty lot’s dirt, loose bags, leaves and other garbage were being kicked onto the crime scene area because of icy 20-mile-an hour wind guests. Red and yellow police tape was fluttering in the the strong winds as a light snow started to fall about an hour after the shooting. It separated news media and other onlookers from detectives looking at the half a dozen shell casings scattered on St. Louis Avenue, just south of Chicago Avenue. 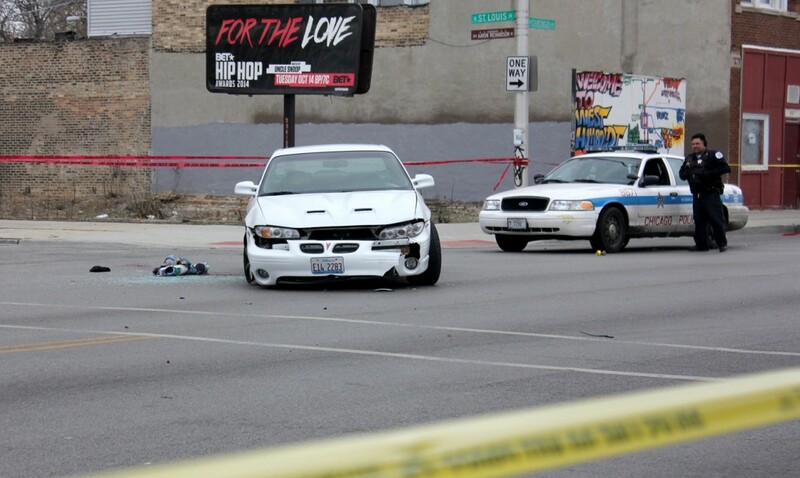 The shooting happened across the street from a CeaseFire location at 3507 W. Chicago Ave. The organization uses an “evidence-based public health approach to reducing shootings and killings,” according to their website. When an employee from CeaseFire left the building to get into his car he was swarmed by news media asking him for comment. “I’m on vacation,” he said, before getting in to his car and eventually driving off.